This will be broken into 3 posts as there’s too many pictures. I was expecting the prison to be big. I wasn’t expecting it to be huge. 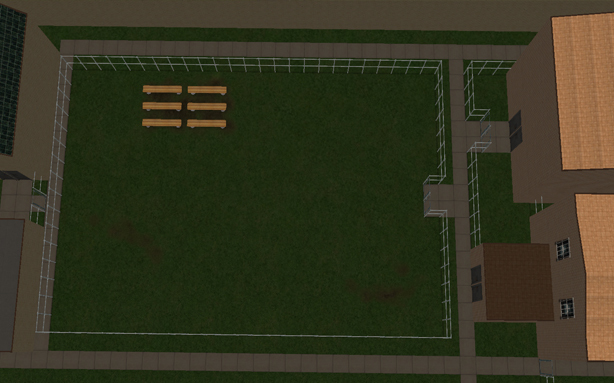 That said, it started on a 5×6 lot, ended up with 5 floors, 6 if you included the roof, and cost more than $400,000. It was MASSIVE. It was complete with 75 beds, although there was space for 180+. I didn’t know there was a limit on the amount of walls you could use, until I hit it at 2100. Thankfully, there was a solution thanks to Numenor’s unlevelled walls! I only had a few more to go and I didn’t know what I’d do if I was stuck on the maxis limit. It took hours to build and even longer to film. I was originally planning on packaging the lot to share with you all, but at the moment I’m too scared to do that as it is huge, laggy, and is likely to start crashing games and what not. That said, if someone wants to take the risk and test it out for me, let me know. My inspiration? 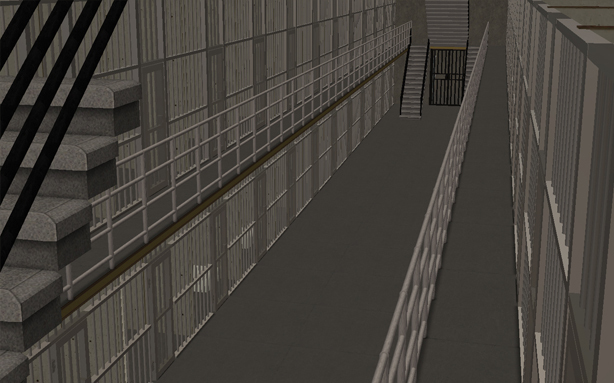 Prison Break’s Fox River State Penitentiary. Of course, it was on a much smaller scale, but you can see a slight resemblance? In the process of building, I somehow accidentally deleted 1 tile of the road and I have no idea how I did it or how to fix it as I only noticed it towards the end (if anyone has a solution, please let me know!) It was my first trial at making custom “curved” rooves (that indeed weren’t curved at all and I didn’t want them to be) though was disappointed to find the floor tiles on these rooves were uneditable so I got stuck with what I had. Still, they didn’t look too bad considering the ages I spent on them. 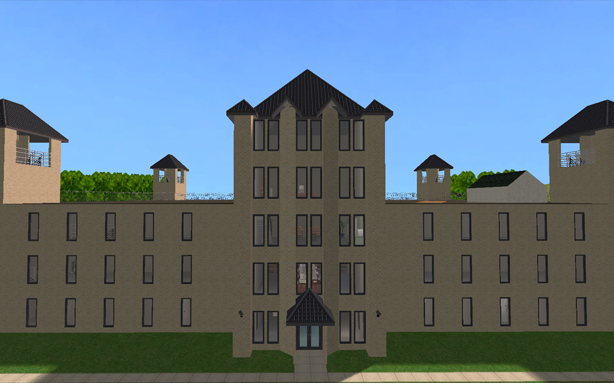 Not only was it my first try at making them, I had 4 buildings close together which the rooves did not like and I constantly had to build and unbuild walls to make them work. In the end, the tiles on both edges of one building remained flat, but not altogether a bad look. Not noticeable from the top, anyway. 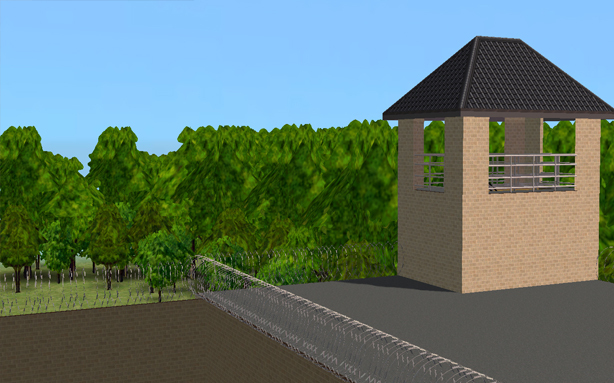 At the top corners were 4 guard towers, built higher than the rest of the prison. On the far side these landed on cement roofing which looked really cool coupled with the barbed wire. 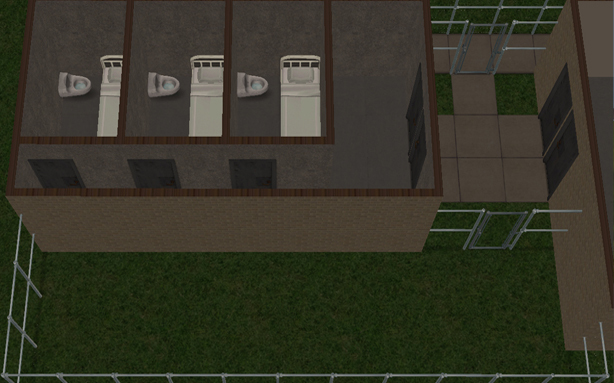 The view from the guard’s towers, as it so rightly should be, looked nicely onto the yard and rest of the prison. The yard was perhaps bordering on small for the capacity of 180 sims, but then again, so was the rest of the lot and there wasn’t much I could do about it except try and make illusions to the eye. Everything was carefully articulated. 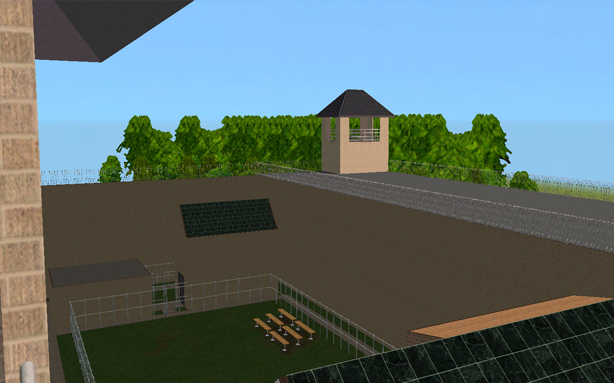 Each path is bordered by barbed wire fencing and gates, making it (seemingly) impossible for sims to gain access to buildings they weren’t supposed to, while still making it all easily accessible (sort of). To me, these little touches made it perfect. Including an isolation block, or ad-seg, administrative-segregation, the hole, whatever you want to call it, which came complete with a miniature yard. These are cordoned off, individual cells designed for inmates requiring protection from the general prison population, or vice versa. Tiny 2×3 rooms which are cold, dark and pretty lonely. 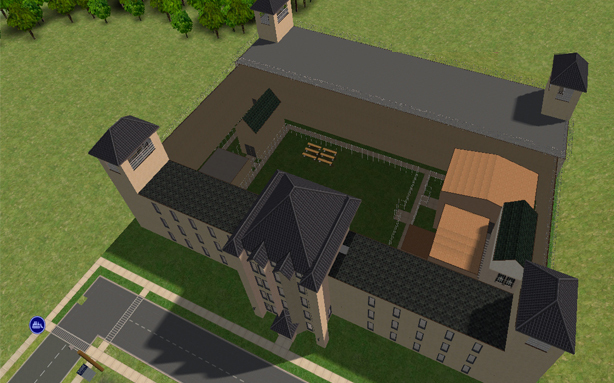 Which is quite a different sight to the main prison block. View from the second floor.